Compression Stocking Tip #5: How Many Should You Purchase? If you have been following my recent tips, then you know where to buy compression stockings, what to look for in a stocking dealer and which kind of stockings are right for you. Once you are ready to make the purchase, it is time to decide how many stockings to buy. If you are like me and come from the shopping school of “When you find something that works, buy it in every color,” you may have to adjust your purchasing habits. Compression stockings are expensive and they do not last forever. Stockings are meant to be worn, washed and worn again. If they linger too long in your dirty clothes basket, the fibers begin to deteriorate. But a life of coming home from work and doing laundry every day is pretty depressing – and not always possible. So the number of stockings you purchase depends on your budget limitations as well as your lifestyle preferences. Here are five stocking lifestyle profiles. See which one fits your budget and lifestyle the best. One pair of stockings can get awfully lonely. If you have the time (and inclination) to wash stockings every night, then potentially you could buy just one pair. But I wouldn’t recommend it. Having only one pair of stockings leaves little drying time after washing – and zero room for error should your stockings get damaged. 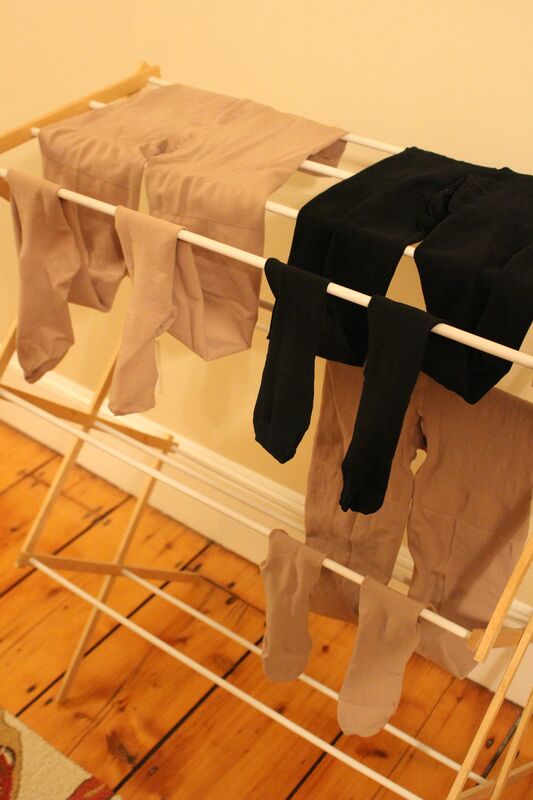 Here are a few pairs of my stockings at rest on my drying rack. If you own only a few stockings, be prepared to stick to a regular washing schedule. The minimum number of stockings I recommend is three. Two of the three pairs are for regular wear (interchangeably every other day). The third is to be kept as a spare and worn only in case of emergency. An emergency is when one of the first two have been damaged and are no longer wearable. An emergency is not when you are too tired to launder the other two pairs. Beware that having only two pairs of stockings in the rotation means you have to stick to a daily or every-other-day washing routine. 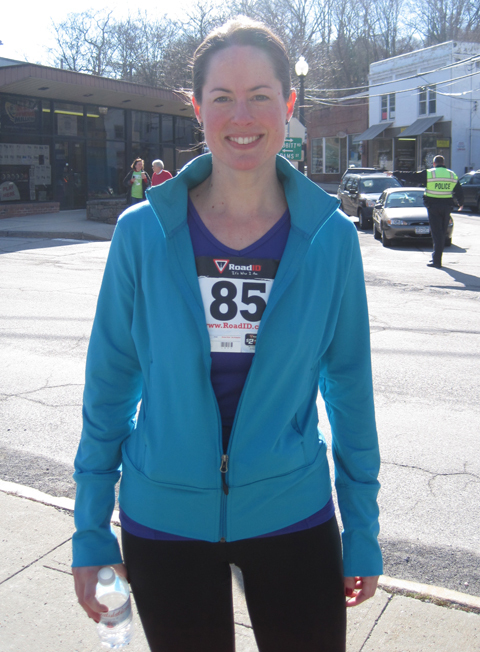 This is me a couple of years ago, after running a 5k. It sure was nice (for me and everyone else around me) to have a clean pair of stockings to change into. If you are very physically active, consider buying four pairs. Two for regular wear, one for exercising and one for emergency use only. With the exception of swimming, all exercise should be performed while wearing compression stockings. If you can afford the expense, then you will enjoy the convenience of having a fresh pair of stockings to change into after going for a run or taking in a yoga class. Once, I branched out from beige/black and tried a “platinum” colored stocking (pictured). I felt like an extra in the movie Avatar. Don’t let that deter you. Pursue your inner Stocking Fashionista. Beige can get old real fast. Luckily, stocking vendors have caught on and now offer garments in a variety of shades. If you want to add color to your legs, then factor that into your budget. I get a lot of use out of black stockings during the winter, in addition to beige-colored stockings. That means I order about twice as many stockings in the cold months as I do in the warmer weather. While this overflowing drawer of stockings may look like compression stocking heaven, resist temptation. Don’t hoard. I’ve had a recurring nightmare about my favorite compression stockings being discontinued. I wake up in a cold sweat, refreshing Juzo’s product website until I fall back asleep. If you win the lottery, you might be tempted to stock up on your stockings. Resist. For two reasons. One, stocking return policies usually extend only 30-to-90 days from the date of purchase. If you crack open a pair that you have been hoarding for six months and discover an issue with the fit or have some other issue, you may have difficulty securing a replacement or refund. Two, compression stocking technology is constantly improving. The style you are in love with now might be even better in a year’s time. The stockings I first donned in 1998 feel like sandpaper compared to the updated version I wear today. Over time, improvements are made to just about every aspect of the garment. 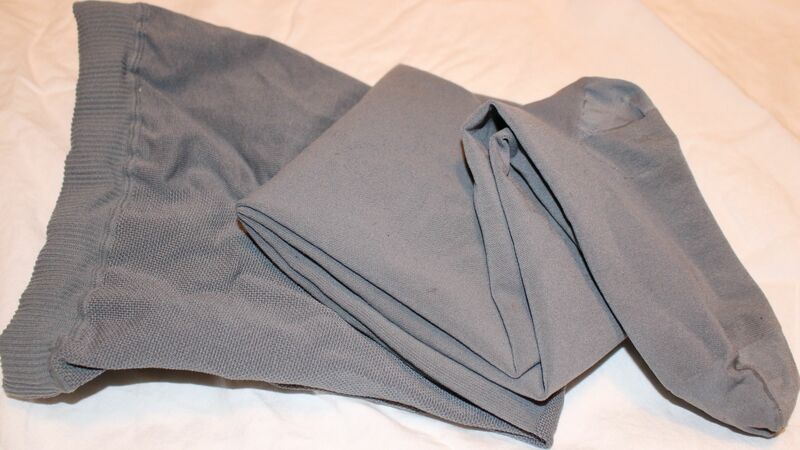 Earlier this year, Juzo made a change to the waistband of the Soft garment I wear. No more bulky elastic to thread through the waistband. Now it’s smooth and fitting. More comfortable and less conspicuous under clothing. If I loaded up on Softs, I’d be kicking myself for not being able to enjoy the new model. Hi, just wanted to say that I’m glad I’ve found your blog. I’ve had primary lymphedema since I was 50 – well, probably more like 46, since I had an apparent episode that then went away (was diagnosed as varicose veins, not lymphedema, so there was no follow-up or prevention). Things have been pretty well under control but I’m having a bit of minor trouble right now and your blog has hit at just the right time. I live in Japan so it’s interesting for me to see the differences in what you do and the treatments you follow – and again to see the differences with elsewhere, such as what Lymphedema Girl has described. Best of luck to you and thanks for doing this!